Today we got some big news lined up concerning 99 Spirits‘ localization progress. First but not least, the translation and editing of 99 Spirits script and graphics is now officially complete! With a month to go till the 31.5. release date, we will be spending it testing and polishing the game to be able to release it in the best condition possible. In this context we want to express our thanks to the alpha testers for their feedback which has helped root out several issues and given good ideas to improve the gameplay in various ways. We are also focusing our efforts into getting more visibility for 99 Spirits. If you write for a game blog or news site and would like to preview 99 Spirits, don’t hesitate to shoot us a message. Secondly, we are happy to announce that a playable demo for 99 Spirits is now available for download! You can get it from our homepage and in time from our distributors. We are excited to hear your feedback! Alright, so the word is out. Our next project is 99 Spirits. There are several points of interest that make this game a very special release for us. 1. The game was just released in Japan. 99 Spirits was released on Comiket 82 in August 2012. That is to say, less than 3 months ago now. We’re looking to release it in early 2013, which means our English version should hit the shelves around half a year after the game’s original release. Given also that this is an RPG, which are among the more difficult genres to localize, a release this fast would be almost unprecedented. Of course, we haven’t decided on a release date yet and won’t release the game before we’re confident we got everything just right, so it might end up taking a bit longer than that, but this ETA is based on our current projections. Though we don’t necessarily target the newest games (as seen in our previous release), this rare opportunity is one we want to take full advantage of. 2. The game is challenging (localization-wise). We like a good challenge, and as we’ve stated on many an occasion, our main criteria in choosing projects is that they are interesting and actually require translation to be playable by English speakers. 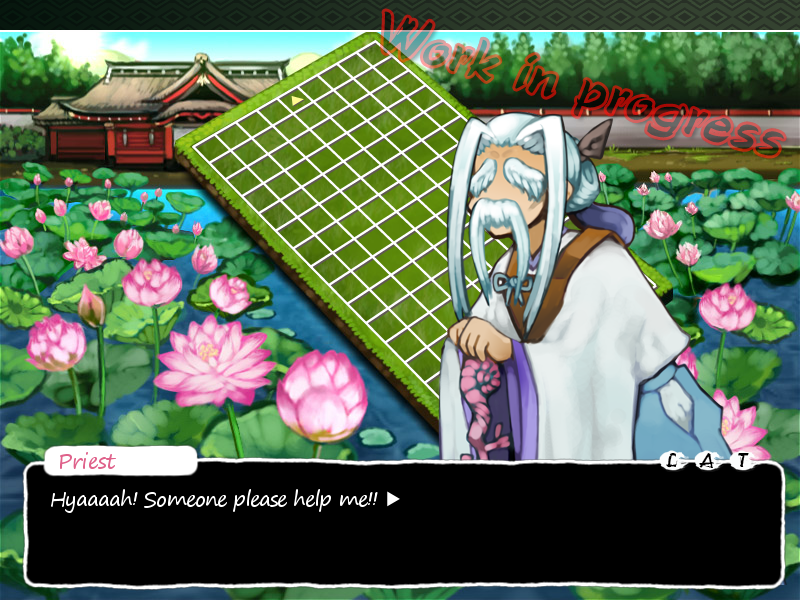 Still, we were almost stumped ourselves by the challenges localizing 99 Spirits promised. At the core of this difficulty lie its puzzle mechanics, which we’ll go more into later. Anyone who has played the game or its trial in Japanese will know what we’re talking about. But hey, this is what we do best! Actually, at War of the Human Tanks’ release party, Yakiniku Banzai, the developer duo of the game, commented on 99 Spirits: “If you guys can translate this game, there’s no game you can’t translate.” We feel the same, and this is another reason why we’re having a lot of fun with this project. Even the initial work on the game’s infrastructure we’ve already completed was a real test of imagination. 3. The game has some damned pretty art. Uh, well, just had to say that! I love all the charming little details in the artwork, like the way Hanabusa’s portrait starts to nod off when you don’t touch the game for a while. Also, a new character has been unlocked in the character section of 99 Spirits homepage’s: Soujun the wandering monk. We’re planning on adding a new character each week. So with all that said, look forward to 99 Spirits when it’s done. Also, if you have something specific you’d want us to talk about on the blog, feel free to drop a comment. It’s an exciting week for us with the release date for War of the Human Tanks finally just ahead: September 14th, this Friday. To celebrate the approaching occasion, here’s an absolutely gorgeous art piece by Angie (@9aia) of Heshiko and Choko from War of the Human Tanks. It made us really happy! You can view this and a bonus Liselotte illustration on our forums’ Fan Art section. The “Let’s Play” guide at http://fruitbatfactory.com/humantanks/guides.html has been updated with Episode 2, check it out, especially if you’ve already played the demo or are struggling with it. The surviving Shock Tanks report that a demo version of War of the Human Tanks has appeared in several locations. Scout Tanks confirm the sightings at GamersGate and Desura as of this moment. Stay tuned for more updates on the situation! In other news, the Guides section for War of the Human Tanks has gone live with the first part of the guide. Rumors say that other sections will be added soon. Meanwhile, the war goes on. Human Tanks are fighting a brave battle on Steam Greenlight. It’s great to see the community response there. Enlist now to join the war effort! All new Human Tanks are welcome to join our forums to discuss the ongoing war.